I haven't blogged in ages, my usual commitment to 'blog every week' generally only lasts a week. Ah, well. My excuse is that it's editing season, I'm almost finished and ready to create more blog posts though! In the meantime, I absolutely had to share some photographs from this amazing waterfront wedding I photographed in September. When I say waterfront, I mean surrounded by water. 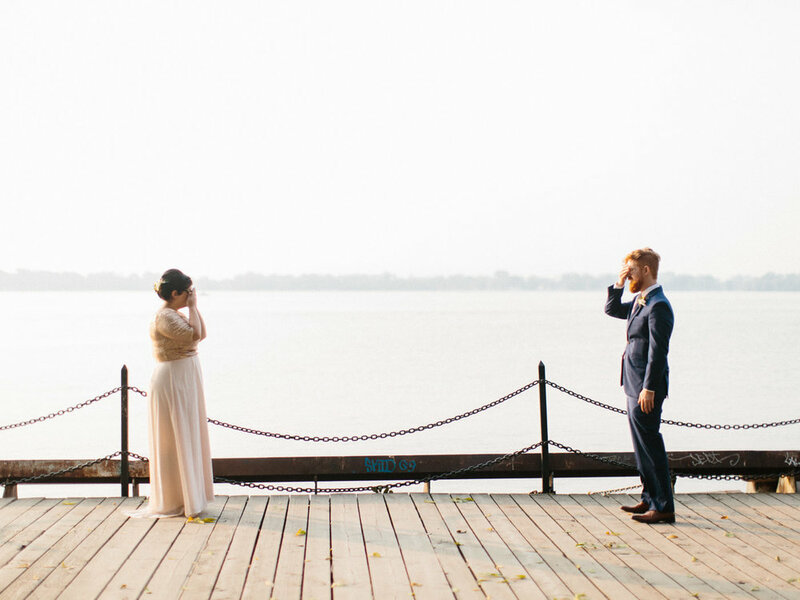 Amena and Adam chose to get married on a boat! More precisely, a beautiful old riverboat operated by Mariposa at the Toronto Harbourfront Center. It.was.amazing. I'll save most of the cool details for a longer post coming up this winter, but in the meantime scroll through for some sneak peeks and possible wedding inspiration. Highlights include: the cutest first look ever, a beautiful jacket with a quote from Star Trek written across the back in gold calligraphy, boats, water, and all things cool, a special chocolate delivery by sailboat, and the most delicious wedding cake of all time. To any couples considering getting married on a boat, after this wedding I would highly recommend it! Also please hire me to photograph everything for you, if I could specialize in boat weddings now I completely would.